1. With the engine off, the ignition locked in the off position, and any required guarding removed, you are now ready to reverse your fan. There is a pink “DANGER” tag provided with your fan that should also be fastened to the ignition switch panel. 4. 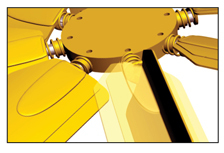 Once the blade is rotated fully to the desired position, the blade will “spring” outward and lock itself into place. Now the blade will not be able to be turned around without pushing it inward again. The reversing of one blade is now complete; continue to reverse the remaining blades so that they are all in the same position. 2. 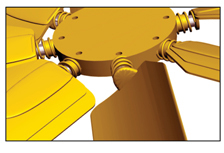 Individually reverse each blade by simply pushing inward (towards the hub) to compress the spring and then begin to rotate the blade; it should only turn in one direction. 5. 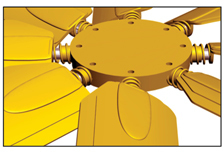 Now that all of the blades have been reversed, the fan will force the air in the opposite direction. You are now ready to re-install the guarding, unlock the ignition switch, and continue operating the equipment with increased comfort. 3. Once the blade begins to rotate, you no longer need to keep pushing inward; continue to turn the blade toward the desired position.